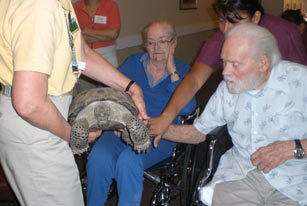 A variety of crafts, games, exercise, music, discussions, and parties is scheduled daily. One-on-one help from staff with therapeutic physical activity is provided on an as-needed basis. We have a diverse team of people, both paid and volunteers, that regularly provide musical entertainment, tell stories, teach arts and crafts, and conduct theme-based programs on music, dance, fashion, reminiscing, etc. Enjoy us for a twist of poker and bingo. Lots of fun. Come early to pick your card. Come and socialized with us while we will start off by self myofascial release and static stretching, then muscle strengthening and finish with static stretching cool down. Targeting range of motion, decrease tension in muscles and relieve joint stress. Come and socialized with us while we will start off by self myofascial release and static stretching, then muscle strenghtening and finish with static stretching cool down.